Steel bicycle rack. Everything is adjustable via bolts and clamps which slide in the track. The steel frame is coated with PVC or other plastic. The coating is chipped off in places, and some areas have rust. Approximately 48" wide x 44" long. 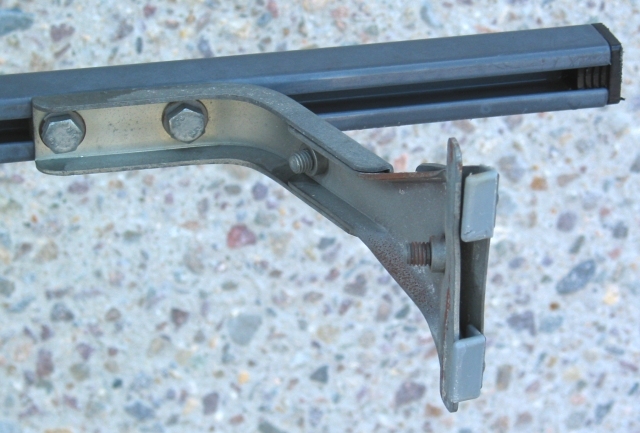 Roof gutter clamp detail. 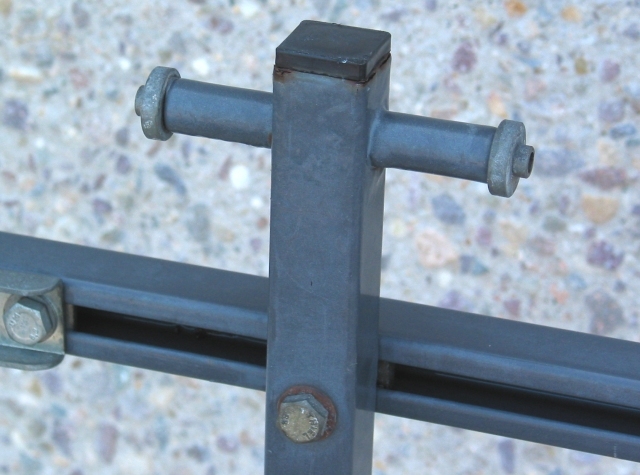 Bolts onto roof gutter. Will not work with gutterless roofs. Bike fork attachment detail. Uses standard "skewer" toggle bolt to secure bike forks to rack. Front wheel must be removed from bike. 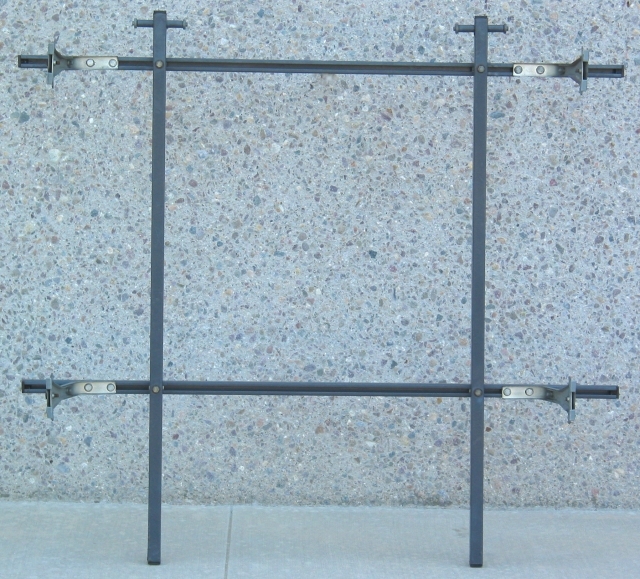 Bike fork attachments do not interfere with use of rack for carrying other items. All items subject to prior sale. All sales are final. Items will be sold to the first party to pay for and remove items from premises. All items sold "as is" without any warranty. All items must be paid for in cash (U.S. $). Items are not returnable for credit or refund. Buyer has the right to inspect item prior to payment and to recind offer to purchase if the item is not acceptable to buyer. Seller has the right to withdraw any item from sale at any time. Any purchased items left by buyer for later pickup must be removed from premises within 14 days. Ownership of items left more than 14 days reverts to seller. Purchasers must contact seller to arrange a mutually agreeable time to make payment and pick up item(s). If purchaser desires or requires a "Bill of Sale", a fee of $10.00 will be charged to prepare it. If you wish to purchase this item, send an email to surplus at laserlab dot com. Be sure to include the item number. Our standard office hours for item payment and pickup are Tuesday and Thursday mornings from 11:00AM to 12:00PM. Be sure to contact us before arrival because nobody may be available to help you unless you let us know you are coming.